One of the most frequent ways to ruin your lab coat is that beverage you’re always drinking: coffee stains. Coffee is unavoidable if you work in medicine, and if you’re human, spills will happen. If you have a cheap lab coat or one that is made of cotton or other natural fibers, unfortunately you probably can’t do too much except throw that lab coat away. That’s because natural fibers tend to absorb liquids really quickly and cling to the colors that created the stain. If you’ve made the (smart and practical) decision to get yourself a high-quality lab coat made of performance fabrics, there’s a high probability you will be able to get that stain out! 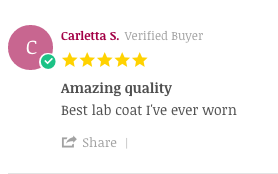 As a matter of fact, if you take a look at the reviews for this brand of white lab coats, you’ll see a lot of people have had no problem rinsing out coffee stains because of the durable, technological fabrics they use. Rinse the stain immediately. Literally, as soon as you can get to a faucet, rinse the stain. Don’t bother with trying to spot clean. It’s not going to work. Apply a stain remover to the brown patch. The designers at Medelita have recommended OxyClean, but the most important thing is to take action as soon as you can. The sooner you apply the stain remover, the better chances you can salvage your coat! Launder as normal with NO BLEACH. The stain should have been released during the wash, and if you have a lab coat made of performance fabric then the bleach will wear down the fibers. This entry was posted in Lab Coats, Men's Lab Coats, Physician Coats, Women's Lab Coats and tagged Clothing Care, Lab Coat Care on September 27, 2016 by Ariel Jacoby. How Many Lab Coats Should A New Doctor Have? Congratulations to all recent medical school graduates and new residents! Now that you have an MD behind your name, you get to ditch the short student coat and finally put on a sleek long(er) coat like the ones you see other MDs wear around the hospital. 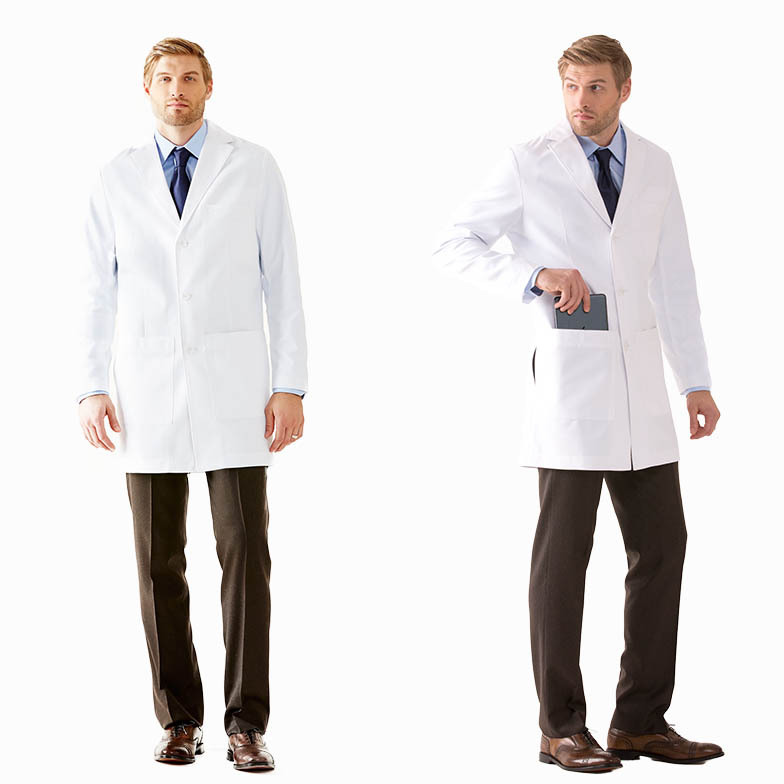 You probably know to choose a lab coat that is high quality and made in a style that fits you well. It may seem superficial and frivolous, but it actually isn’t: sometimes perception is reality and the reality is that patients perceive doctors in white coats to be more competent than their peers without. 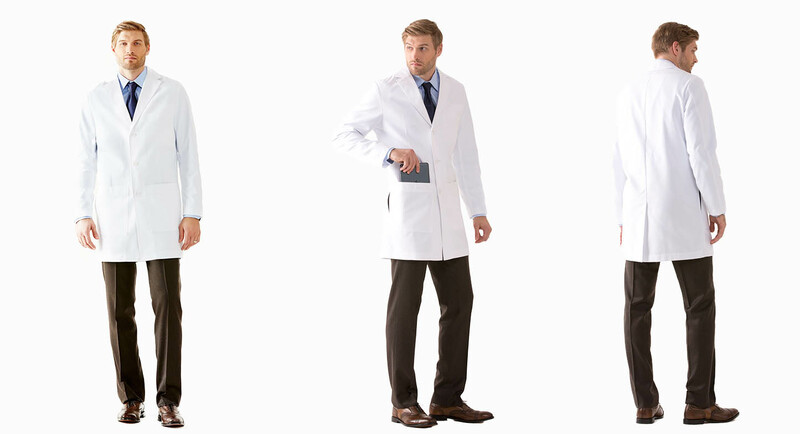 But how many lab coats should you have as a new doctor? The answer to this question really depends on your access to a washing machine. Just for the sake of hygiene and sanitation, you’ll want to wash your lab coat after each wear. So if you are able to do laundry every day, you might be able to get by with one lab coat – but if you’re washing it every day there is a greater likelihood that the coat will start to experience some wear and tear pretty quick. We recommend having at least 3-5 lab coats for this exact reason. That way if your favorite coat gets ripped or stained, or if you don’t have time to wash them after every shift, you still have a nice professional lab coat to get you through your next shift. 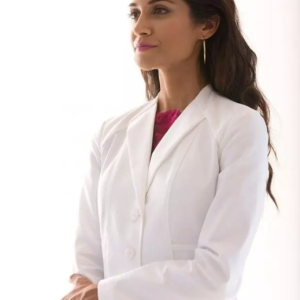 Optimally a practicing doctor should have five lab coats, one for every day of the week, though as you continue your medical career you might find that your white coat wardrobe grows along with you! This entry was posted in Lab Coats, Physician Coats, Student Lab Coats and tagged Doctors Lab Coats on September 6, 2016 by Ariel Jacoby. Podcasts are a great way to stay up to date on news stories and learn about things you never thought about before. They are ideal for listening to during a commute, or while doing tedious household chores. Listening to a podcast is the first thing I do every morning, as it wakes my brain up and stimulates thinking as soon as I wake up, preparing me better to take on the day. One of my favorite podcasts is NPR’s Invisibilia, which tells stories “about the invisible forces that control human behavior – ideas, beliefs, assumptions and emotions.” These stories are often things you probably never even thought about before, and it prompts you to look at the world in a different way. Recently, Invisibilia featured an episode entitled “The Secret Emotional Life Of Clothes”, which explores 7 different stories to examine how what we wear affects us more than we might think. The most poignant story, in my opinion, was their analysis of the theory of “enclothed cognition“, based upon a study in which participants were asked to complete a simple stroop test. Some participants completed the test in their regular clothes, while others were asked to complete the test while wearing a white doctors coat. The study found that on average, participants wearing a white lab coat made fewer than half of the errors made by the other study group. Interestingly, some participants were also asked to complete the test while wearing a white coat, but were told that it was a painter’s coat rather than a doctor’s coat. In these cases, participants also were not as accurate as those who believed they were wearing a white doctor’s coat. This is an interesting exploration of how feeling like you are dressed professionally gives you more confidence and actually enables you to perform better intellectually. It is surprising that the simple act of putting on a white doctor’s lab coat would actually make you perform better on a test, but the proof is in the pudding. This entry was posted in Lab Coats, Miscellaneous, Physician Coats and tagged physician lab coats, White Coat on August 1, 2016 by Ariel Jacoby. Do White Coats Really Spread Germs? Over the last few years a debate has begun about the deficiencies of lab coats worn in doctors’ practices and clinical settings. Most criticisms have to do with the spread of germs and a lack of hygiene. On the surface, these claims seem to make sense – but dive a little deeper, and you’ll actually see that this threat is mostly bark with very little bite. As a matter of fact, with the proper care and worn in the right settings, the white coat is still very much an integral part of the patient care experience. 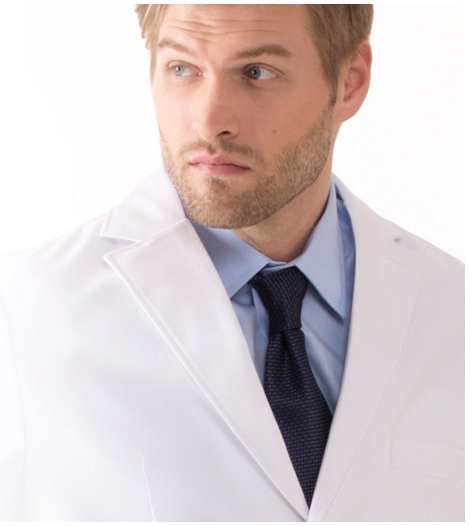 The white coat of today comes in performance fabrics that help doctors reduce the likelihood of spreading germs. Because the fact is, germs and bacteria are everywhere anyways – take off your white coat and you have bacteria on your arms and hands. There simply is no escaping all the bacteria, but there also hasn’t been any research that indicates doctors’ lab coats spread bacteria in cases of hospital-acquired infections. Actually, in the UK health leaders started implementing a “bare below the elbows” policy for doctors with their lab coats. The intention was to prevent the spread of germs through the sleeves of the lab coat, which are the most likely to pick up bacteria throughout the work day. However, studies found that this measure didn’t have a significant effect on the reduction of hospital-acquired infection in patients. As long as you launder your white coat regularly, there is very little evidence to indicate that lab coats are any more unhygienic than any other garment worn in a clinical setting. I would recommend that you wash your lab coat 3-5 times a week – not only will this reduce the amount of dirt and bacteria day-to-day, but keeping your lab coat fresh at all times is an easy way to prevent the buildup of these in the fabric as well. This entry was posted in Lab Coats, Medical Professionals, Physician Coats and tagged lab coats, Patient Safety, White Coat on June 17, 2016 by Ariel Jacoby.